Hey, We’re Cool is back this Thursday night at L’etage and all signs point to a show filled with love and romance. Joining the self-described ‘lovable comedy cherubs’ are Philly Sketchfest alums, High Dramma, stand-up comedian, Joey Dougherty, music from Barbecue Gordon and plenty of opportunities for the audience to get in on the fun with new games and stunts that Hey, We’re Cool are known for. Hey, We’re Cool is hosted by Matt Aukamp & Patrick Reber and with material written by Quinton Alexander (Adventure Friends), Jacquie Baker (The Flat Earth/The Incredible Shrinking Matt & Jacquie), Kev Ketner, Chris McGrail (Goat Rodeo), and Matthew Schmid (The Flat Earth/The Incredible Shrinking Matt & Jacquie). Philly Improv Theater (PHIT) is putting up a sketch show that as of this posting, has yet to be written. We’ve asked everyone, even those involved, and no one can tell us what to expect. Why? Because it’s being done in the ‘sketch cram’ format of writing the entire show in 24 hours. And because they are the Philly IMPROV Theater, they’ll be building the foundation of each sketch through improvised scenes that will then be written into sketches. Comedians taking part in this 24 hour gauntlet include Christopher Gory, Judy Weightman, Gabby Thom (Wretched Hive), Courtney Painter (Barbara Bush/Dog Mountain), David Donnella, Alyssa Jackson, and Paul Triggiani (Secret Pants/The Flat Earth). Fresh off their debut at the 2015 Black Friday Comedy Marathon, ‘It’s The New’ premieres a new set of sketch as part of The Dungeon’s comedy night at Kung Fu Necktie! Get out an support this brand new, Philadelphia-based sketch group comprised of Jackie Benhayon, Erin Fleming, Dru Kramcsak (Monologues at PHIT), Andrew Nealis, Jack O’Keeffe (Charlie Harley/Music Show), Bill Reick and Gabby Thom (Wretched Hive). Filmed sketch offers groups an ability to reach audiences outside their locale while also opening up creative opportunities not available in a live format. However, the ability to receive immediate feedback from an audience is otherwise absent. That’s where Brought To You By… fills the gap, premiering new filmed sketches from Philadelphia-area groups in front of a live audience. Hosted & curated by Casey Hogan, Peter Szekeres, and Alex Coffey, the trio also integrate live material in-between videos. After that, it’s Monologues hosted & curated by Dru Kramcsak. This month’s monologists include Julia Hudson (Barbara Bush/Sweetish), Joe Moore (Dog Mountain/Guilty Pleasures), Nicole Yates, Gabby Szczepanek (Temple Tonight), Josef Kardos, and Dru Kramcsak. Quite possibly both the best deal and biggest deal in Philadelphia this week, The Bechdel Test Fest is a ten hour event celebrating women and trans comedians in Philadelphia. For a mere $20 (or $35 with a cool festival T-shirt) you get access to the entire ten hours which includes sketch, improv, stand-up, music, and clowning. We’ve included the entire line-up below but definitely make it a point to check out sketch sets from Kathryn & Sarah, The Bloomers (University of Pennsylvania), and Leah Lawler. 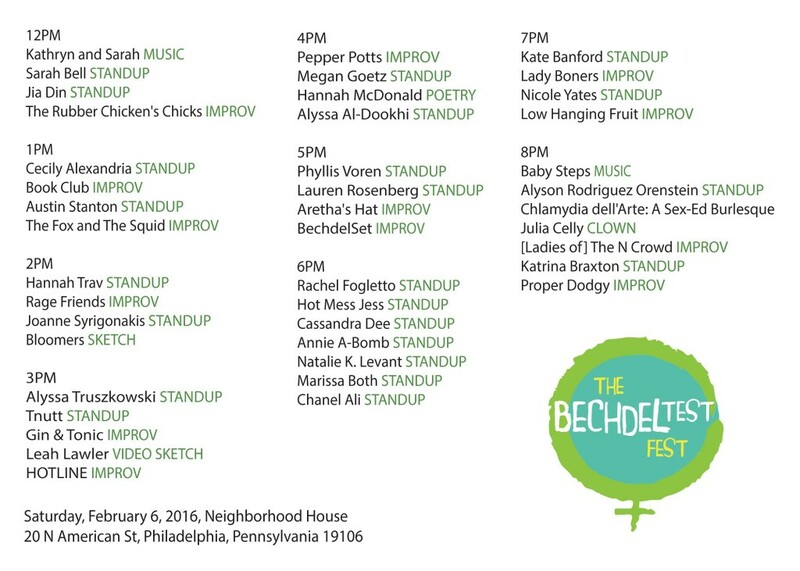 Philly Sketchfest is a proud sponsor of the inaugural Bechdel Test Fest.